I have a Noble Designs space! So it's not really new news, but I'm just now getting around to sharing it on my website! I found a barn, renovated it and moved Noble Designs out of my basement and into its very own space. And I couldn't love it more! 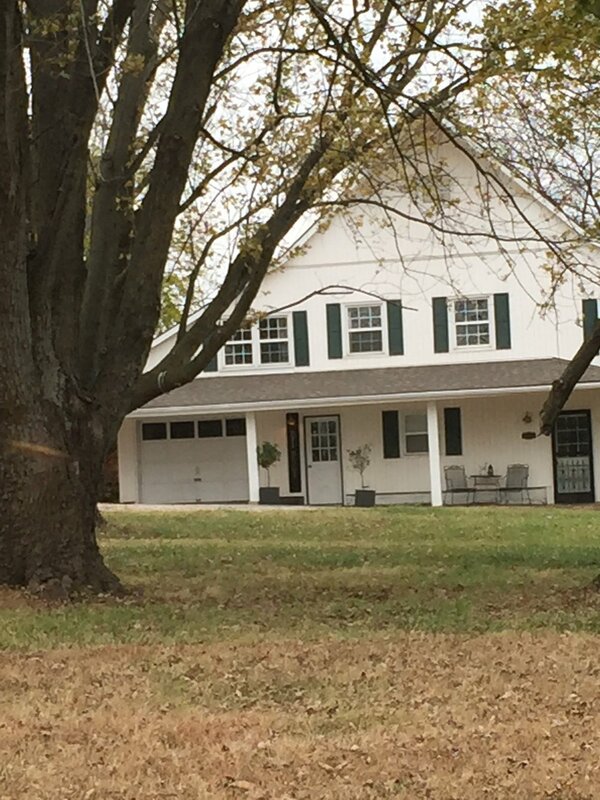 I got the idea in my head to renovate a barn for Noble Designs, and spent too much time driving around south of my home looking for something I could buy. Crazy that I thought it would work but, hold onto your hat, it worked! Chris George Custom Homes built my personal home and Chris George lives about 3 miles away from me on 80 acres. He had an old hay barn that was turned into duplexes in the 70s. No one had touched my unit since then. It had peeling linoleum and orange carpet. What are the chances! I think the barn served a good purpose for a couple of family tenants, but it was in desperate need of a facelift. So I got to work! Demo was a bit of a project. Then all white paint, new light fixtures, new floor, new first level bathroom, a small kitchen area and I was done. It actually was a lot of work for Complete Renovations, and put a dent in my pocketbook but it was worth every penny. My staff doesn't have to see my messy house or me in my PJs. Parking is better here and — most of the time — it is a really peaceful place. Truth be known I'm a city girl that wants to be adapt to the country, but creatures aren't my thing. I went out to my car one late night, turned on my car and there was a deer staring right at me. It was terrifying and magical all at once. So the fabrics are out of my basement at home, but new projects replaced them. However, the barn is where most of the work takes place. So book your appointment to come out anytime — I'm happy to show it off! We continue to refine it and bring in product so you can see and touch the quality products we offer. I have lots more to share about the project, but for now I'm going to leave you with a few special pictures my talented friend, Jamie Borgman, recently took for us. Wednesday staff meetings keep us busy. We occupy the left side. It's rather peaceful as it sits on a little bit of country that is really in the city. Our small but stylish kitchen. A huge improvement over the urinal that did occupy the space.